← What TWISTED Mind Invented Soap? Well. . .sort of first hand. See, the problem is, in my case, the face that emerged looked less like the Lord Jesus and more like the Sith Lord from Star Wars. And that’s not the first time I’ve seen a clearly-not-Jesus face appear. Karl Marx appeared in my wooden door grain, Mark Twain clearly lives on my bathroom marble floor, and I’d swear I saw John Goodman in a cow pie (my apologies John, but it is what it is). There have been Jesus sightings by people all over the world in the most unlikely of places—places like Cheetos, clouds, banana peels, baby scans, end of a log, grain of a rocking chair, stained tea towel, (I am not making this up!) rusty side of a refrigerator, freeway underpass, tortilla, granite countertop, bottom of a turtle shell, and my personal favorite—stains on the coffee mug of an atheist. These people are serious. They take photos, slap them onto Facebook, and start a viral ooh-and-ah fest round the world with amazed and reverent supplicants. This behavior actually has a very impressive name with its roots in Ancient Greek: pareidolia. And while I was unable to obtain the exact pronunciation, I am clear on the meaning– which loosely translates to I think I’m in love with my toast. 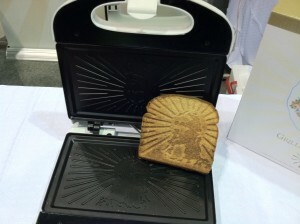 So powerful is this longing to see the face of Jesus in an unusual place, this year’s Christian Retailer’s extravaganza provided the opportunity to purchase a George Forman-like grill that imprints the face of Jesus on your grilled cheese sandwich . . .which begs the question, just how do we know what Jesus looked like, and moreover, does He prefer Gouda, Brie, or Cheddar? While cynicism is one of my spiritual gifts, I don’t want to rule out the possibility that there may indeed be some authentic appearances, but you’ve got to know how to evaluate these things. The Catholic Church, being fully aware of just how often this can become silly, has taken this evaluation process very seriously, even producing a checklist of Rules Regarding Apparitions explaining how to judge the validity of a sighting. Among other things, it includes looking at the individual who found the sighting with a very cautious, even cynical eye. Is she a true adherent? Or did she jump on this bandwagon recently, bringing with her other questionable practices like swinging dead chickens over her head before prayer? Is this an unusual thing in her life? Or did she also see David Bowie in her freezer’s frost last week? My sightings of the Sith Lord, Mark Twain and John Goodman have taught me something; if you look around long enough, you’ll see faces in everything. No really. Start looking and I’ll bet you have a dozen before bedtime. But I think I’ve also learned something else. Rather than looking for the face of Jesus in our coffee stains and our mulch piles, I think our time is better spent trying to BE the face of Jesus. Walking up to the kid in church who reeks of cigarettes and doesn’t know how to speak without swearing—and just sharing a joke with him, all in a desire to let him know he’s welcome here. NOW you’re seeing the face of Jesus show up in truly unexpected places. Admittedly—it’s maybe not as striking as a face emerging in bacon drippings. It’s not Facebook worthy. Little bobble-head dolls aren’t going to appear with your giant grin nodding rhythmically from the back of someone’s Kia. Nope. But there is a such a hurting world out there. They need to know hope. They need comfort for what is sometimes a powerful loneliness. They need to know that the God of the Universe knows their face. And I suspect, that no matter how beautifully rendered, none of us will ever find such beauty and truth and hope in a cow pie. Amen and and well-said! There is a particular woman at our church that induces many eye-rolls and sighs. Not because she’s awful or mean but because she is so excitable. I admit that at first I was an avoid-er but when I got to work with her a little I fell in-love with her heart for Jesus. I no longer go in the other direction and I share my appreciation of her with others in hopes they will see too. We miss blessings when we assume anything about another person.